This comparison is regularly updated to help you find the best plugins of 2015! Welcome to the best comparison of the best eCommerce plugins for WordPress! Let me help you find the cheapest WordPress e-commerce plugin that is perfect for your specific requirements and budget! To get started simply enter which features you will definitely need from your eCommerce plugin in the form below. After pressing “Compare Now” you will instantly get your individual comparison results and can see the top alternatives that offer all the features you require at the best price! Go here for more details on how to use this comparison. How many blogs do you own? Do you find this comparison helpful? Please share it! The search form above is meant to give you a personalized comparison and let you compare prices of the different WP e-commerce plugins. The chart below on the other hand is meant to give you a quick overview over which kind of features you can find in all of the eCommerce plugin alternatives. If you find this huge table too confusing you can also use my heads up comparisons between two specific eCommerce plugins instead. Features marked with free in the chart are available in the free version of the plugin. Features marked with addon are sold as a separate extension. Hover over the text to see the starting price of the extension. There is a lot of money in eCommerce and as such there is a lot of money in WordPress eCommerce plugins and as such there is a lot of competition in this market! On the one hand that means you have a lot of choice and that it was never easier to build a store with WordPress. On the other hand choosing the right eCommerce solution has become harder and requires you to navigate through a jungle of feature lists and addon marketplaces. I hope my comparison helps you find the right way! The pricing models for the different eCommerce solutions are surprisingly similar. All have a basic free version available and most then charge for individual addons. When you first arrive to this page you will notice that all the ecommerce plugins are listed as being free. Don’t get too excited by that! To build a serious e-commerce store you will need to pay for extensions. For most solutions you will at least need the payment processor addon of your choice and probably also a few of the additional shopping functionality addons. To get a more realistic expectation of what you would need to pay for each plugin remember to check the features you need in the search form above! For most plugins extensions / addons are priced per site. That means you have to pay more if you want to use your addons on more than 1 blog. Because of that be sure to also select your number of blogs above. Note that some of the offered extensions are built and maintained by 3rd parties. You can find them on the developer site but need to purchase them somewhere else. In this comparison they are listed together with developer’s own extensions. A few e-commerce solutions offer extension bundles that contain several popular addons at a discounted price. Those bundles are not reflected in my price comparison but if you need many features for your shop you might be able to save a lot by using them, so look around for them. Some of the eCommerce solutions are more specialized on specific niches than others. WooCommerce is the most general one, thanks to its large number of extensions, but remember that each of the extensions comes with a price tag! Easy Digital Downloads, as the name already reveals, is primarily focused on digital products and selling software – as such it has fewer shipping and inventory related addons available. Please note that eCommerce plugins simply have too many features to compare them all. That does not mean I admit defeat but for the sake of clarity I had to limit this comparison to the most popular and useful ones. For the popular shopping carts (especially WooCommerce, but also Easy Digital Downloads and Jigoshop) you will find many more addons, adding support for smaller or country-specific payment processors and other niche features. Is the plugin easy to use? To answer this question download a demo or free version (if available) to get a closer feel for how the plugin works. How good is the plugin interface? Try watching some Youtube videos of each WordPress e-commerce plugin in action to get an idea what the admin area looks like. Is the support fast and helpful? Consider just getting in touch and asking some questions before your purchase to see what kind of answer you get. Is the plugin updated regularly? Check if they post about new version releases on their website. For products with a free version in the WP plugin directory you can browse the changelog there. Chris Lema talks about 6 different eCommerce plugins and recommends which is best to use for which purpose. This article takes a look at 4 different shopping cart plugins and includes a useful feature comparison table. Finally I want to stress that this eCommerce plugin comparison only compares prices and features as reported by the developers. It can not tell you whether those features actually work or in which WordPress e-commerce plugin they work better. I recommend you use my comparison as a starting point in your search for the best WP eCommerce plugin and then try some of the top choices yourself! 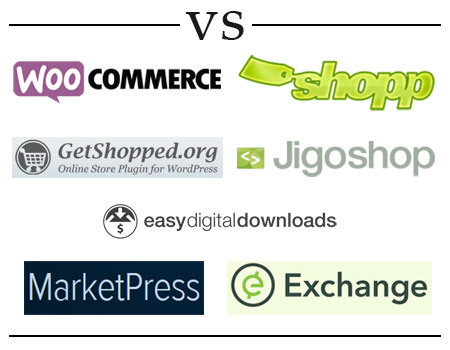 Using this comparison is very easy, certainly easier than actually choosing one of the WordPress e-commerce plugins! In the form at the top of the page enter which features you will definitely need from the eCommerce plugin of your choice by checking the boxes next to each feature. Because many eCommerce plugins increase in price depending on your number of sites you should also select on how many blogs you intend to use the plugin with the dropdown box. After clicking the “Compare Now” button the top WordPress e-commerce plugins based on your requirements are shown on the right side. By default the results are ordered by how well they match the features you have searched for. You can change that with the “Order results by” dropdown, e.g. to display the cheapest WP e-commerce plugins in front. Features: This comparison tracks a number of features that are commonly found in the best eCommerce plugins. The number next to each alternative shows you how many out of all those features you can find in this particular product. Features are listed as reported by the developers. Missing Features: This will only show up if a WordPress e-commerce plugin does not offer all the features you need (defined by your selection in the comparison search form). All products are displayed regardless of how many features they are missing with the best matches listed higher. Price: The price as calculated for your number of blogs and required features. The goal is to show you the exact cost you can expect when deciding to purchase one of the alternatives in order to help you find the cheapest eCommerce plugin possible. All prices are as listed on the developers websites. Bulk or automatic discounts are factored in if available. There can be minor variations due to rounding errors. If you find a product has changed their prices please report it so I can keep the list updated. Reviews: This section lists the average rating of the plugin given by WPscoop users. If available the average rating from the WordPress.org plugin directory or the CodeCanyon marketplace is also listed. Download / Order Link: Many of the products compared here offer you a way to test their service for free. Some offer a basic plugin for free, others a demo on their website or a refund period. You will find the details next to each plugin. If possible I recommend you try and test any WordPress e-commerce plugin yourself before buying. All the data about prices and features is coming directly from the developers. I want this comparison to be an objective starting point in your search for a great WP eCommerce plugin. Because of that it only contains hard facts and no subjective verdict by myself. Since most WordPress products are regularly updated and prices get changed often I need your help to keep this comparison up to date! If you spot an outdated price, find an error or notice that a feature was added to one of the WordPress e-commerce plugins please leave a comment so that I can update the article. Thank you! Which eCommerce plugin do you like best? Is there another plugin alternative I should add to this comparison? Feel free to leave your suggestions in the comments below. If you wish you can also contact me directly! Thanks for this great comparison guide! I’d like to see which, if any, ecommerce solutions provide a premium Support addon. And which offer different kinds of support: active company supported support forum, support tickets, email support, phone support, chat, etc. Implementing an ecommerce solution and payment gateway is often tricky, and when any problem arises is often consequential and costly. Some plugins make the process of getting support difficult (*cough* WooCommerce) and at least one (*cough* WooCommerce again) which offers only a support ticket system is currently, at least, (Nov. 2015) badly understaffed and thus much too slow on responding. Being able to receive prompt and personal support is key to me for an ecommerce solution. Waiting/hoping for support from the plugin’s WordPress support forum, fine for some other types of plugins, is not sufficient for an ecommerce solution, so I’d like to know more about support options. Thanks for your great post. I’m looking for a plug-in that allows me to charge for my Moodle on-line courses. My main site is hosted on wordpress so I was looking for a WP plug-in. I also want to sell my coaching services that way. Do you know if there’s a plug-in that works with services? Thanks for listing Cart66 Cloud here. Just wanted to let everyone know that we are now able to offer Cart66 Cloud for just $95/year. That includes over 80 payment gateway integrations, recurring billing, memberships, subscriptions, digital and physical products, and all the security you need for a safe and PCI compliant WordPress store. Since we provide a secure hosted checkout page you don’t even need your own SSL certificate. You get all of this for less than what you might otherwise pay for just a payment gateway add-on and and SSL certifiate. Thanks Leo, I will check out WP Easy Cart and see if I can add it to the comparison. It is a eCommerce plugin I have not heard of before. I was scanning through the list of things on here and we can nearly every aspect on here…. so would be a good comparison. thanks for your comment. I will look into your EasyCart and consider adding it to my plugin comparison in a future update! I also would like to see WP EasyCart on this list. It is currently my primary contender but would like to see how it compares beyond those shown on the EasyCart site. From what I can tell it may meet a lot of the 50 features you include, all at a single price. Thank you Andrew, seems I missed that. Fixed now!